I love seeing the thinking process that happens when kids do mazes. My daughter likes to start at the end instead of the beginning because she swears its easier that way. 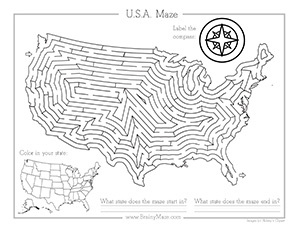 I don’t know, but I like doing mazes myself, too, and these patriotic mazes from Brainy Maze might be just the thing to fill some time on our road trip that happens to be coming up around the Fourth of July. There’s a United States maze with a couple of extra activities on it, a flag maze, a Statue of Liberty with a little handwriting practice and more. These would be great to add to an activity notebook for the car or to keep on hand while you’re waiting for the fireworks to start.